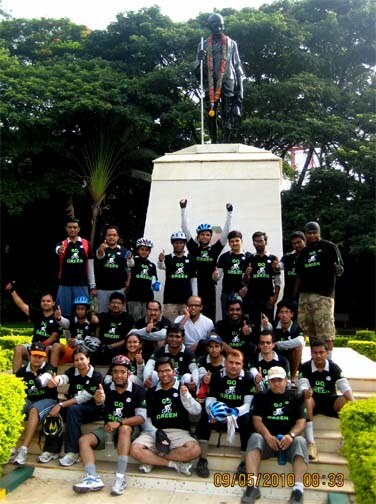 Go Green Campaign Ride towards Cubbon Park. 09 May 10 - GGI-Group size: 4000+ Professionals, Increasing on day to day basis, Come & join us 2 serve Mother Nature. 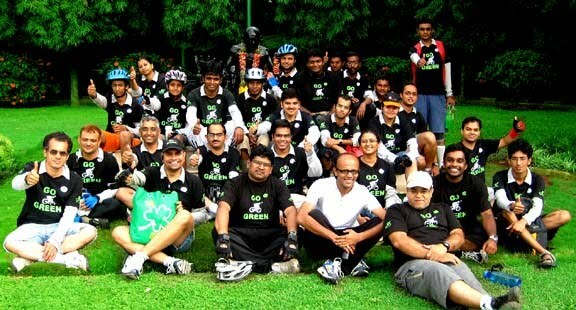 Totally 32 Members participated on 09May10 Sunday's GoGreen Campaign Ride.. 19 GGI's from South, ie JP Nagar 1st Phase & Jaynagar 5th block's Cross Road's I-Store started off @ 6:45am sharp & reached Cubbon Park by 7:25am. A demented news paper boy on a cycle over speed-ed between Shashi & Sanjana and took a immediate left without making any signal. Sanjan was confused and missed to apply brakes and hit the rear side of the cycle resulted in a crash. She lost control & landed with minor injuries (both knee and both palm's scraped.) 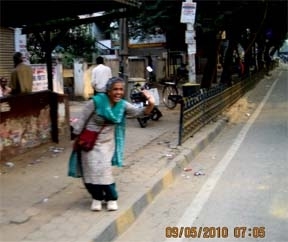 A 3/4 or a full trousers and a pair of hand gloves always do help to minimize these type of injuries..
An elderly women @ a bus stop waving her hand & encouraging GGI's .... Hats off to these people who really show-up their support. Initially we thought of going towards Ulsoor Lake but when we reached MG Park, decided to park our Cycles and get into the park. We had Our Inventor Rashmin who was with us hence planned to make him share few invention that he got patented. We felt Mahatma Gandhi Park is know for starting wrong things but we from GoGreen team wanted to start a Good thing which is going to make our India proud.. All the best to him and his future inventions..
Cubbon park Huddson circle Gate - Kasturba Rd - MG Road - Brigade Road -Residencey Rd flyover - doubel road -Lalbagh Main gate - Lalbagh rear Gate - Ashoka Pillar - Swiming Pool road - Jaynagar 4th block - KFC - Jaynagar 5th Blk Cofee day/ Apple Mac show room. Names of Participants who attended the Campaign Ride.